An artist in Chicago takes the game to the streets. Monopoly can be a viable training tool for success in the real estate market. The game is much like real life – walking down blocks, passing different train stations and neighborhoods, seeing the Water Works in the distance. So it's kind of appropriate that a street artist in Chicago has been installing elements of the board onto the actual streets of the city. 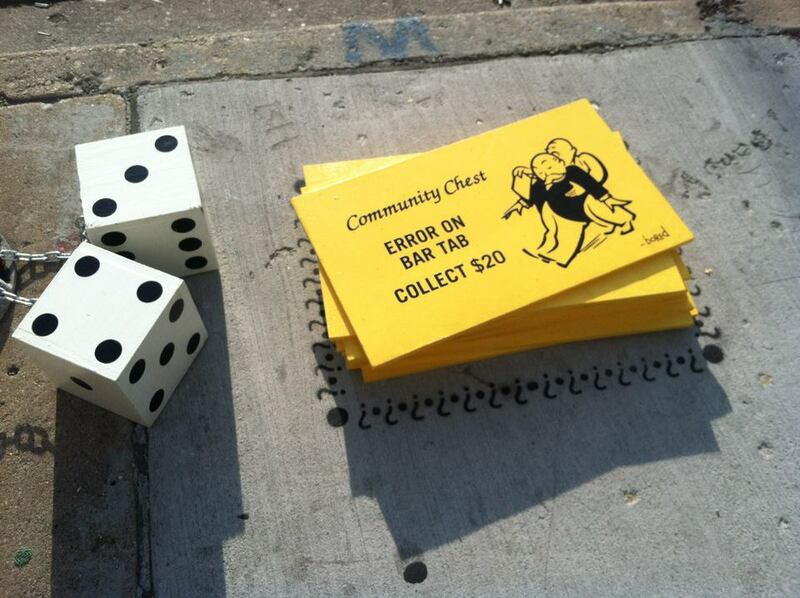 I noticed this bit of the game - stack of Community Chest cards - outside of a restaurant in the Logan Square area on a recent visit in the city. A few blocks away, I found this stack of Chance cards. Both are secured to the sidewalk. The card reads: "Carissa, will you marry me? If yes, advance one block south to nearest church." Nobody at the Armitage Baptist Church one block south seemed to know of any marriages or successful proposals. This post from the local blog Avoision theorizes that it's just part of the art. The community of the Chicago subpage on the website Reddit noticed a few of these in late April, and based on this image of the Community Chest cards the text is periodically changed. Elsewhere there's also a Luxury Tax sidewalk panel and this property space with two houses. All this made me wonder about bringing a full-sized version of a game like Monopoly to the actual streets. I'm not talking just a bigger version of the game – which is actually a thing in a park in San Jose, California. Rather, I imagine that the common block-like board game layout could be transposed onto actual city blocks. We already know the format, and we already have the city blocks, so why not? If anybody's done this or has some ideas on how it could work, I'd love to hear.